2. Choose the cat shampoo you use carefully. Each cat is different, and if your pet shows any signs of skin irritation or dryness then you may need to switch products to prevent any irritation. 3. The right grooming supplies can make all of the difference in your grooming routine and results. Before you start the grooming make sure you have all the supplies you will need, so you do not have to stop in the middle to fetch something. 4. One of the most helpful cat grooming tips is to make sure you include plenty of petting and affection during the process. 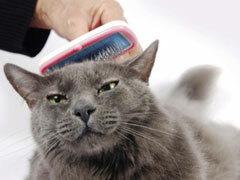 Most cats enjoy being stroked or brushed, and this can be fun for both of you. 5. If a cat bath becomes necessary always start by washing the head and then work towards the tail. This will prevent the cat from getting any soap in their eyes or face. 6. Never continue grooming once your cat starts to get annoyed or no longer seems to be enjoying it. You may have to include more than one session before all of the grooming is done, but you will have a cat that is happier. 7. You can get cat grooming tips from a professional if you are not sure of something or have questions. It may be worth the cost to have a professional demonstrate the proper techniques and tricks, so you understand how it is done. 8. Pregnant cats should always be gently handled, to avoid hurting the kittens or causing the cat to panic and become aggressive. Make sure the products that you use are safe for pregnant animals before you buy them. 9. Never wake your cat up to groom them. This is one of the top cat grooming tips, because cats tend to get upset when they are woken up, and this can keep the grooming from being an enjoyable experience. 10. A blow dryer can be one of the best cat grooming tools, but many cats will not tolerate the sound of this appliance and may become panicked when you turn it on. If your cat will not allow you to blow dry their hair then a towel rub may have to be enough.